Wednesday is National Letter of Intent signing day. Kearney High and Kearney Catholic will each be hosting signing ceremonies. 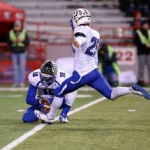 The Kearney High event will feature two members of the football team; quarterback Brayden Miller and kicker Gabe Heins who are pledging to walk-on at Nebraska. Other signees include Bearcat wrestling standout Phillip Moomey who is signing on at Cornell, Elle Dahlgren will be competing in track and field at Kansas University, Michael Huebner will be diving at Iowa, Claire Vanderbeek will join the Hastings College volleyball team, Courtney Thee will compete in track & field at UNK and Rhianna Bayley will join the Aqualopers. The Kearney High signing ceremony is scheduled to begin tomorrow morning at 7:30 in the CHAT Auditorium at Kearney High School. The Kearney Catholic ceremony is set to begin at 8:30, and will feature two more members of the football team. Lineman Sam Clinch will attend UNK, and running back Linden Howe will attend Drake. The Star’s Eli Richter signed his letter of intent with Nebraska during the early signing period in December.